Just In Time For Valentine’s Day! Little Star Bleuette Friend! Just in time for Valentine’s Day! I am listing this beautiful “Little Star” (S&H 1448) Bleuette “Friend”! 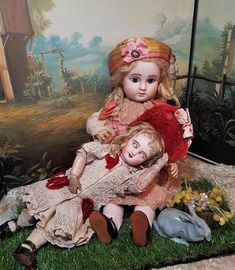 This doll has been sold. 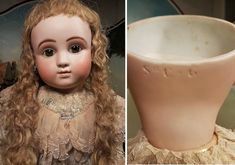 This beautiful museum quality antique reproduction 12″ ”Little Star” S&H 1448 Bleuette “Friend” was lovingly created by world renowned porcelain doll artist Connie Zink. 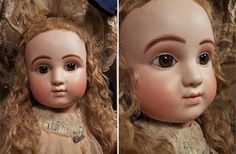 “Little Star” has perfectly painted china painted features including authentic eyebrows, delicate eyelashes, multi-shaded mouth and flawless cheeks. Just a hint of eye shadow finishes off her superbly painted face. “Little Star” is on a wooden composition reproduction Bleuette body. She comes complete with dark brown human hair wig, blue-grey threaded glass paperweight eyes, white cotton underwear and slip, a white and red heart “Valentine” dress made by Clara Pelfrey, white socks, white shoes, red earrings and wooden base doll stand. Each doll is individually hand-painted by Connie Zink and no two dolls are alike. 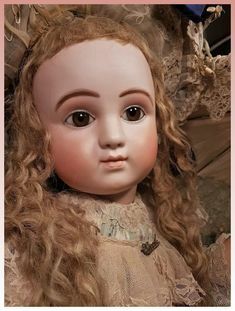 If you are looking to add a beautiful antique reproduction Bleuette “Friend” to your collection this doll is for you. 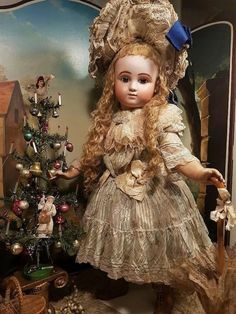 The cost of the dressed doll as shown is $350.00 This doll may also be purchased undressed with wooden base stand for $295.00. Priority Mail shipping and insurance is $18.00.